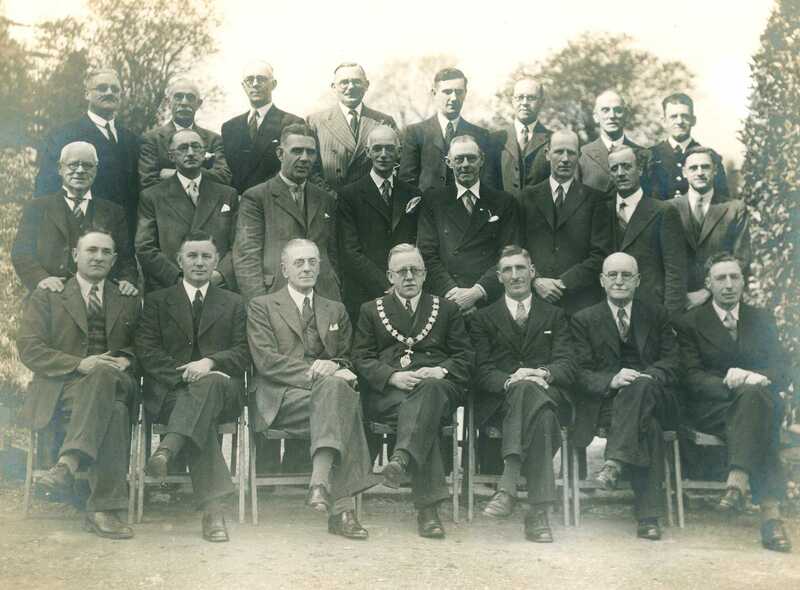 This picture was loaned to us by Castle Point Council and shows members of Benfleet Urban District Council assembled for the group photo in March 1946. Council members above, I see Mr Clough, headmaster of Thundersley Dark Lane school. The chairman of the council in 1946 was my grandfather, Walter Johnson, who had a long association with Benfleet Council. He can be seen on the left hand side of the group photograph for 1929, where it is mentioned that he was associated with the fire brigade that he had helped to establish. On another page he can be seen on the far right of the group standing in front of the new fire station in 1926. Walter Johnson was born in 1890 just off the Old Kent Road in London, but moved to Benfleet in the early 1920s. I believe he sat on the council originally as a Liberal, but in later life became a staunch Conservative. He appears again, evidently enjoying a social event, in the first photograph of Sir Bernard Braine MP.